We are a specialist activity team within the Scouts SA Adventurous Activities section, focusing on STEM and innovation through electronic-based activities such as robotics, radio technology and project kits. One of our current projects is the Edison educational robot – a LEGO brick compatible programmable robot for teaching programming, coding and robotics. We also support and promote the largest annual international Scouting Event – JOTA JOTI. Our program is currently being developed from the ground up and will be officially launched at the 25th Australian Jamboree, to be held in Tailem Bend, South Australia in January 2019. More details on the Youth Program page. Our secondary function is to provide robust radio communications for Scouting and Community Events, which we achieve with a commercial UHF radio system. We maintain a fleet of 50+ handheld and 12 mobile commercial radios which operate on 2 portable repeaters. These repeaters are usable South Australia wise and can be located in the harshest remote environment due to their robust water and dust resistant Pelican cases, 100+AH batteries and solar panels. Our radios are Tait TP8100 and Icom IC-400PRO. More details on the Event Communication page. The Commissioner for Children and Young People (SA) challenges children in South Australia to complete four coding / digital thinking activities during 2019. 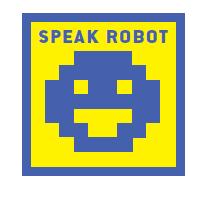 This challenges Cub Scouts and Scouts across South Australia to enjoy fun and innovative activities that are free, step-by-step and suitable for every level of skill and experience to earn their exclusive ‘Speak Robot’ badge. The Challenge opens on 29 January 2019 and closes on 27 September 2019. You can choose any four lessons you like. Try coding with Star Wars®, Frozen®, Moana®, Angry Birds®, NBA® and Minecraft®, build a musical instrument, make a rock, paper, scissors game, make a bracelet that hides a secret message using binary code. There are hundreds of lessons to choose from – some that can even be completed without devices. There’s a page of recommended activities for those with no prior coding experience. Even if you are taking part in the Challenge at school, you can take part as many times as you like outside of school! Each Youth member is entitled to one ‘Speak Robot’ badge only. Venturers can speak to their Leader to discuss conducting sessions where they take a group of Cubs or Scouts through each activity as part of their Award Scheme.